However, in a presentation based on the responsibilities of an officer when dealing with innuendo and slander, the judge advocate concluded his case by saying that a man could be indifferent to scandal, “but a woman has no defense save that which may be found in the arm of some avenging friend.” If the wife of a brother officer was so accused, it was the responsibility of other officers “to confute and resent that slander and not to aid in its circulation.” Reno was found guilty and dismissed from the army. Bill gave me this book for Christmas, and I finished reading it a few days ago. It was an interesting glimpse into the hardships of life on the American frontier in the late 1800s. Most of the women in the book were officers’ wives, because, back then, they were the ones who knew how to write and sent letters home to family. These women, often from wealthy families, gave up a comfortable life in the Victorian East to follow their husbands into a hostile environment. Considered mere “camp followers” by the Army, they lived and raised a family to the sound of bugles. They dealt with severe cold, blistering heat, bugs, snakes, wolves, hostile Indians, all-too-friendly Mexican women, starvation, disease, lack of good drinking water and no indoor plumbing. They gave birth in the middle of nowhere with soldiers delivering their babies and then throwing them both right back in a wagon to get back on the march. They tended to the wounded and the sick. They prepared the dead for burial. They defended themselves, their modesty, their children, their husbands, their livestock and even their country’s forts with guns, knives, and iron skillets. They enjoyed a much greater degree of Independence, freedom, and prestige than they would have in the rigid civilian society of the established East. I enjoyed this well researched book. As an Army wife on what was the beginning of the American frontier back then, I found an even greater appreciation for my military housing – even with a furnace that only chooses to work 16 – 18 hours a day. I’ve already promised my copy to a local friend, then I’ll be mailing it off to my sister. I find the trials and successes of women that have looked beyond what they have originally been offered as a ‘correct’ way of life as something interesting and inspiring. Going to the Musuem of the North at UAF, there were quite of few stories of pioneering women who came to Alaska and made a difference to the history here. Not all ended as well as could be hoped, but 150 years later, I am reading about them, and that says something.And I am looking forward to reading the book. Thanks! Sounds interesting. 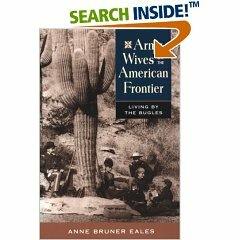 There was a Frontier Wives book in our library, but it sounds a bit different from the book you’re describing. Did it talk about the Soap Box Row at all? Usually, the laundresses were NCO wives, and they sometimes make more than their husbands…I thought about naming an FRG newsletter Soap Box Row…but nobody got it. Barb – they do talk some about tours in Sitka. I think you’ll really like this book.Susanna – they do mention Soap Box Row, and how the laundresses (usually married to NCOs) were considered part of the army, but the “ladies” (usually married to officers) were just “camp followers”. Yeah, talk about PCSing: weight allowance for officers was something like 1000 lbs. If the family moved with the unit, it might take two or three months of marching (every morning – break camp, every evening – make camp). If a wife traveled by “public” transportation, it might cost $500 – a huge chunk of money, and not reimburseable.And in the event of Indian attacks, men had no intention of allowing their wives and children to be taken alive. And just like us, these women could have chosen to stay put in the east. They might have seen their husbands every few years. Love is crazy.